Students in this year’s Piano and Chamber Music Institute (PACMI) at Samford University June 5–11 will have the usual schedule of daily lessons and rehearsals, but with an added first for the state of Alabama. PACMI will host Alabama’s first master classes that allow students to perform on a Yamaha DCFX Disklavier reproducing piano in Samford’s Brock Recital Hall and receive real-time coaching from a Juilliard School of Music faculty member in New York City. The two-hour, high-tech master classes will be held on Thursday, June 9, at 6:30 p.m. for precollege students, and on Friday, June 10, at 10 a.m. for college-level students. The public is welcome to observe the sessions. “Mind-boggling technology,” is how Samford Professor and PACMI Director Ronald Shinn describes the process that allows a student’s performance to be reproduced live on an Internet-connected Disklavier at Yamaha studios in New York. From there, veteran Juilliard faculty member Julian Martin will be able to coach the students on pacing, dynamics, color control and other nuances. As a student performs a piece in Birmingham, Martin can demonstrate suggestions from his Disklavier piano. The student pianist and other observers can watch Martin on a large video screen above the Brock Recital Hall stage. As Martin plays in New York, the keys and foot pedals will go down on the piano in Birmingham. “It’s a regular master class, but separated by 1,500 miles,” said Shinn, who brought his established institute with him when he joined the piano faculty at Samford’s School of the Arts nine years ago. PACMI is now in its 16th year. His wife, Barbara Shinn, is codirector. Yamaha is providing the DCFX concert grant, which Shinn calls “one of the best pianos in the world,” for Samford’s use. It arrived in Birmingham on June 1 following a program in Chicago, Illinois. The 21 students who are registered for PACMI represent Samford, high schools, middle schools and home school programs throughout Alabama, plus a school in Indiana. During the institute, students live on campus and attend daily sessions in music theory, ear training and other topics, and piano lessons and master classes with Samford music faculty members and guest instructors. 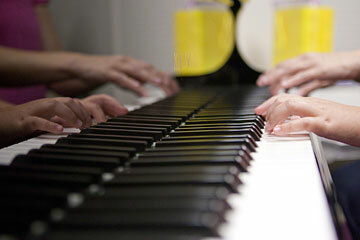 Each student pianist will also rehearse and perform a chamber piece with faculty string and wind players. Beyond learning technique and musicianship, Shinn says that participants benefit from the bonding, mutual support and friendships that occur during the program. Unlike members of a band or orchestra, Shinn points out, pianists do most of their work alone. “When we come together, students realize they are not alone, but are part of a larger musical universe,” Shinn said, adding that the classes, activities and camaraderie result in a motivational push that provides fuel for further study throughout the year. Read a related story with more details on how the Yamaha Disklavier remote lesson technology works.